Every year, luxury lovers from all over the globe flock to the finest beachfront holiday villas in Bali for a serene and tranquil holiday retreat. There is plenty to see and do on the island, which has become a go-to destination for indulgence and pleasure. With a variety of gorgeous villas dotted less than a few minutes-walk away from the crystal-clear coastal waters, you are guaranteed to find relaxation. This list of luxury pool holiday villas in Bali is the perfect introduction to finding the sought-after paradise of your next barefoot getaway. 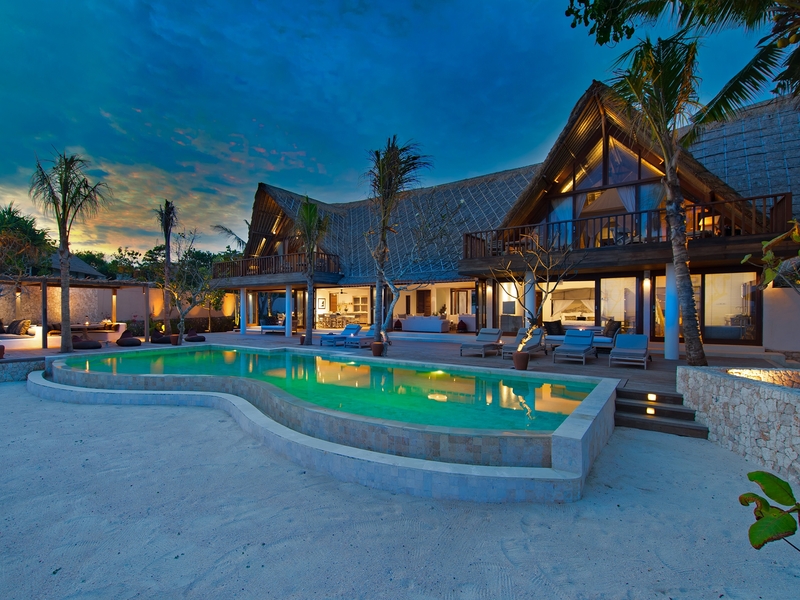 Possibly the most luxurious of the beachfront holiday villas in Bali, Atas Ombak Villa has in fact been featured in Marie Claire fashion suits and Vogue articles – for good reason. ‘Atas Ombak’ is Indonesian for ‘on top of the waves,’ which this villa may as well be given that it is such a short walk from the crystal clear ocean – commanding a hundred meters of beachfront for your personal uninterrupted bliss. The private paradise features a large swimming pool and entertainment pavilion within its acre and a half of lush gardens. 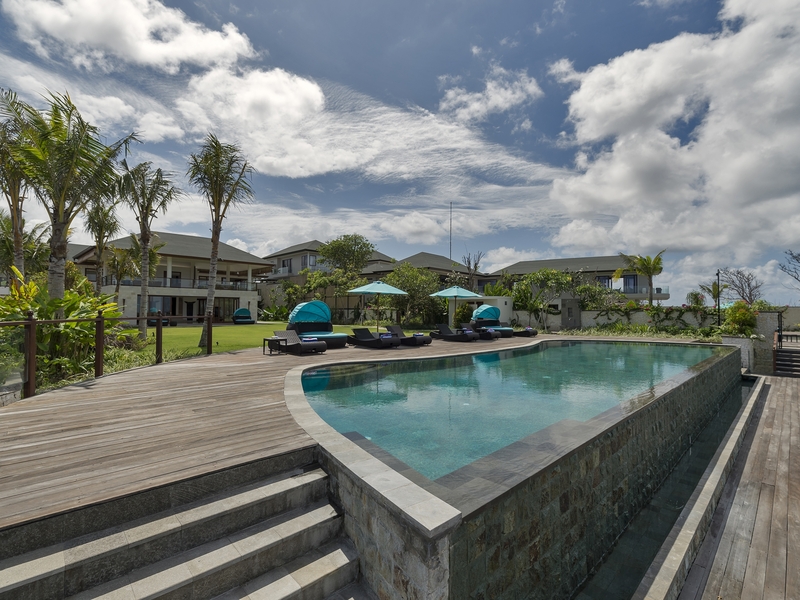 Guests are welcome at the nearby Canggu club, which features a full gym and spa, tennis and squash courts and a football pitch. Atas Ombak Villa is a genuine slice of heaven, but don’t be mistaken – you won’t feel isolated in this oasis of tranquillity. 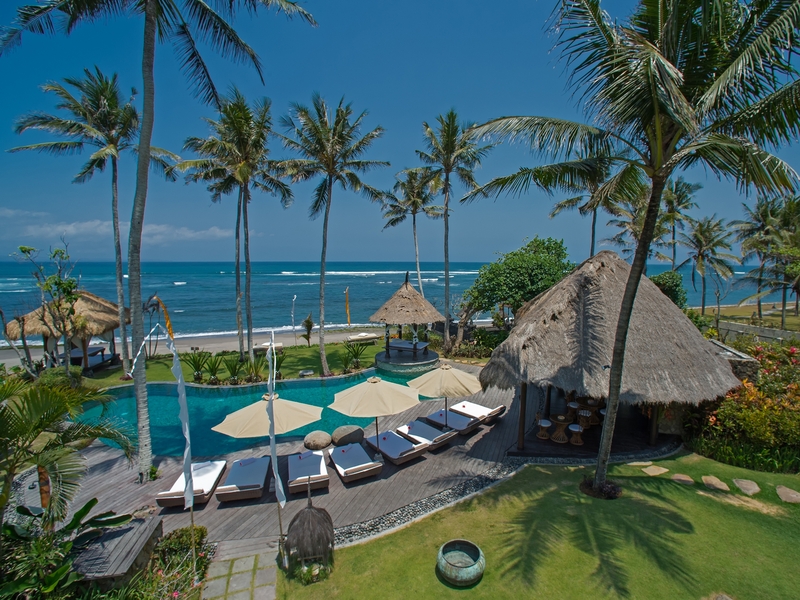 Nestled between Seminyak and Canggu, there are a range of excellent restaurants just a short beach walk away. A contender on any list of luxury pool holiday villas in Bali, this villa is a stunning contender for weddings and special occasions. Or perhaps you are simply in search of quality family time, watching the sun set below the horizon from the peace and quiet of your private pool. Either way, Attas Ombak Villa guarantees an indulgent getaway. Prepared to be waited on by amazing staff and spoiled by your own personal chef as you wander amidst the swaying palm trees of the sprawling gardens. The villa features seven mind-blowingly spacious rooms each with its own unique decor and fitted with all the modern comforts you could need. Equally roomy are the open-planned living areas and a state-of-the-art gourmet kitchen. For completely al fresco luxury, kick back in the outdoor living area which is decorated with beautiful antiques before enjoying an indulgent massage in the thatched garden bale. 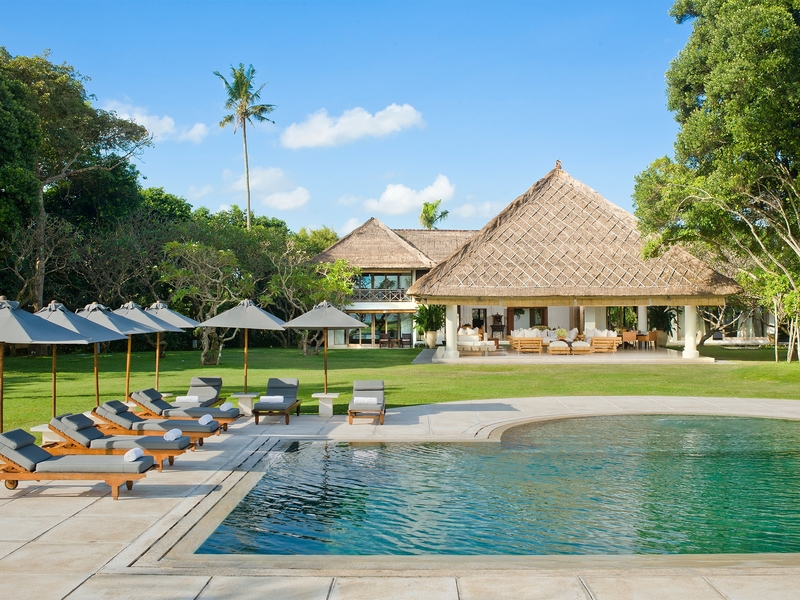 A true oasis of serenity, Tama Ahimsa is one of our favourite luxury holiday villas in Bali. 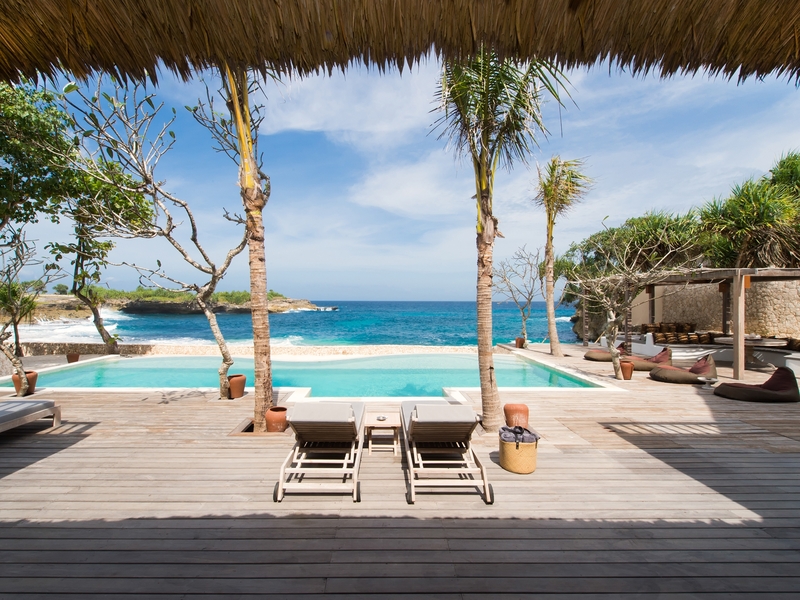 You will find the gorgeous double-height pavilion of Villa Voyage off the Eastern coast in Nusa Lembongan – featuring glamorous luce nomad themed interiors and boasting some of the most gorgeous beach-side vistas of all the luxury holiday villas in Bali. If reclining in a vast, beautifully lit, open-planned living space sounds appealing to you then the Villa Voyage will not disappoint. All five spacious bedrooms are accompanied by comfortable queen-sized beds and en-suite bathrooms for ultimate comfort and privacy. Lavishly decorated, this is unquestionably one of the most relaxing villas to enjoy a tropical retreat beside the white sands and clear blue waters of the Balinese coastline. Guaranteed to provide an idyllic yet life-changing holiday! One of the top beachfront holiday villas in Bali, Villa Rose is a beautiful modern twist on the classic tropical beach-side retreat. If you are looking to experience Bali’s spectacular evening skyline from a divine, open-planned private resort then this may well be the perfect villa for you. With four spacious and almost identical bedrooms over two floors (each with a private marble-floored en-suite) you can expect genuine privacy as you enjoy the attentive service of the butlers, housekeepers, gardeners and kitchen staff. The impressive and spacious living area features a bespoke 14-seater dining table, whose glass top rests on a network of polished roots surrounding a massive tree-trunk base – one of the many unique and enthralling features of Villa Rose. Need more inspiration for your relaxing getaway? Check out this list of the Top 10 Natural Pools and Hot Springs in Bali to add to your itinerary. Start planning your luxury retreat today!